At the heart of Tosoh’s every Automated Immunoassay Analyzer (AIA), is the patented Unit Dose Test Cup (UDTC) reagent system, where freeze dried reagents are present in unitized test cups. 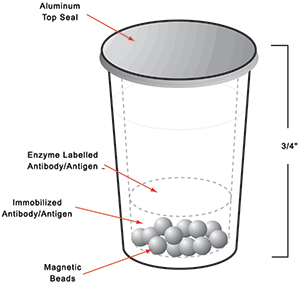 UDTC’s are self contained disposable plastic cups containing pre-defined quantities of magnetic nanobeads coated with analyte specific capture antigen/antibody and enzyme labeled secondary antibody/antigen respectively. Each individual cup is sealed with a foil which increases the reagent stability and calibration stability. Individual packaging prevents reagent wastage and reagent contamination.